Last time we saw Echo & The Bunnymen was just under 12 months at the Move Festival and despite the fact that the comeback albums had little to offer in terms of grand statement it was their back catalogue that saw them hold their own and blow away the likes of Alfie and Elbow who'd appeared previously that day. It's with the trepidation which we approach "Slideling" with and the fact that it features ex-Cast bassist Peter Wilkins and guest spots from Coldplay frontman Chris Martin as well as guitarist Jonny Buckland and actor John Simms has done little to eleviate our fears. Our fears quickly vanish after repeated listens to "Slideling" where McCulloch seems to have a renewed energy in which he takes the same simple formula of Bunnymen tracks such as "Nothing Lasts Forever", rather than the spaced out earlier work, and yet manages to instil an energy and free flowing beauty throughout. 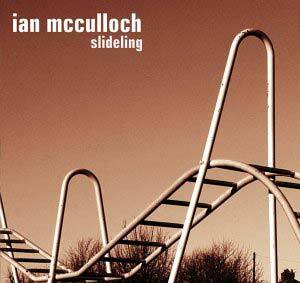 The single "Sliding" with it's descending piano motif features Chris Martin on backing vocals and it's easy to see the influence McCulloch has had on Coldplay's recent album. Lyrically McCulloch has explored the age old themes of escaping your past and reaching a new dawn but even though the lyrics of a song such as "Baby Hold On" song like out-takes from an American self help book it's just the beauty of everyday language that prevail in our darkest times. Bizarrely "She Sings (All My Life)" sound halfway between primetime Bunnymen and "Top Of The World" which McCulloch wrote with Johnny Marr and sung with the Spice Girls for the England World Cup a few years ago. Although looking at the credits I feel this may be to with a mysterious Hodgens on songwriting duties. It's only really the opening track "Love In Veins" which brings back memories of those terrible comeback albums from the Bunnymen which weren't so much bad, as just plain ordinary and when you consider that McCulloch always set out to be anything ordinary leaving us with no emotional reaction at all is more than a crime - it's a cardinal sin. "Slideling" is a return to form and yet again another album that has come out of Liverpool smashing Manchester's efforts to smithereens.